Meryl Streep follows up her role as a witch in the Disney musical Into the Woods with the story of an aging rocker in Ricki and the Flash. Jonathan Demme directs a screenplay by Diablo Cody in one of this year's first real Oscar contenders. The first trailer has arrived, which continues to showcase Meryl Streep as not just an actress, but also as a musical presence that has no equal. 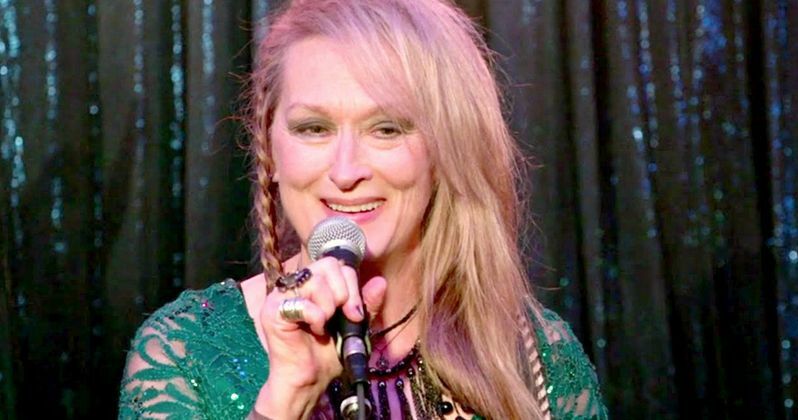 Ricki and the Flash finds Meryl Streep taking on a whole new gig as a hard-rocking singer and guitarist. The original and electrifying film is loaded with live musical performances, which the actress performed herself. Meryl Streep stars as Ricki Rendazzo, a guitar heroine who made a world of mistakes as she followed her dreams of rock-and-roll stardom. Returning home, Ricki gets a shot at redemption and a chance to make things right as she faces the music with her family. Meryl Streep stars opposite her real-life daughter Mamie Gummer; Rick Springfield, portraying a Flash member in love with Ricki; Kevin Kline as Ricki's ex-husband; and Audra McDonald as Kevin Kline's new wife. Take a look at this sneak peek, then get ready for a rock and rolling good time as Ricki and the Flash hits theaters everywhere this August!